I have issues with my right neck to shoulder muscle, I am looking forward to try the exercise for that area. Hopefully it will relax that particular muscle. Look up ‘Makenzie exercises’ which are good for the neck .. I have the same issues on my left side .. Wow!! Would like an app showing these to access whenever I need it! Stretching you muscles on a regular basis can release tension, build muscle, strength, and stability in your whole body. Prevent muscular atrophy ( muscle wasting) with simple stretching exercises. 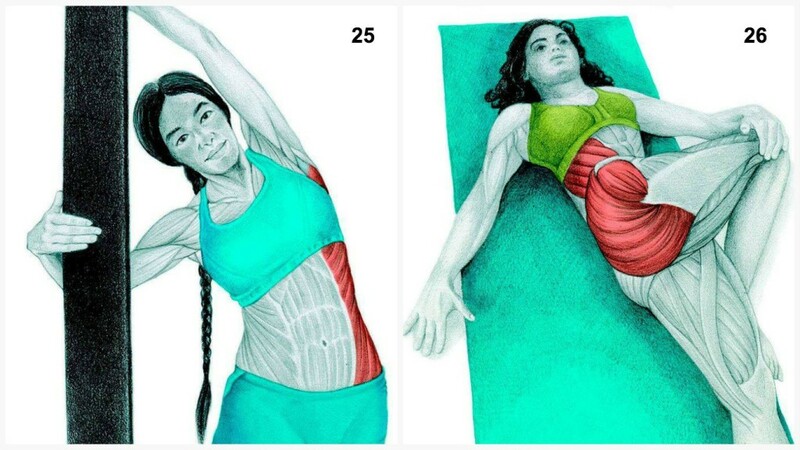 You can find great yoga routines that focus on specific muscles to tone and tighten and can be completed in 30 minutes or more depending on your needs. Yoga classes can be found online or at your local gym. Go at your own pace and modify the pose to fit your personal fitness level. Yoga routines include Yoga for weight loss, Yoga for flexibility, Yoga for core abdominal workout, Yoga for beginners or advanced level and, Yoga for back Pain relief. Find a routine that suits your specific goals and you will feel more relaxed and energized throughout your day. Love the pictures resulting in a top notch post. I might have to try some of these myself. Its very important to stretch. thank you for this post. very much appreciated. Stretching is something I always forget about, this is great. Thanks!